Do you know what the phallic rock is...or does....Want to guess? The Molokai Tours from Maui gives you the opportunity to fly to Molokai, and discover its unique beauty & history. Largely untouched by the grandiose resorts of Maui or the high rises of Oahu, Molokai offers a taste of Hawaii unlike any other island. When you visit Molokai, you get a glimpse into Hawaii’s past. The population is about 7,000 hearty residents, and it is the fifth largest of the main Hawaiian islands. You will have an experienced local tour guide in a comfortable air conditioned bus or van. 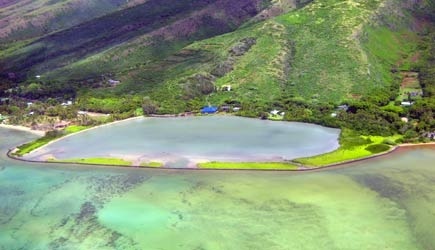 On this tour you will check out sites on the topside of Molokai. The Molokai Tours from Maui include Coffees of Hawaii, Halawa Valley Lookout, Molokai Museum, Pala’au State Park, Purdy’s macadamia nut farm, Kapuaiwa Coconut Grove, St. Joseph’s Church, Kaunakakai Harbor, Kauleonanahoa, fishpond and more. Also on this tour is Kalaupapa Sea Cliff Lookout and Father Damien’s churches (now St. Damien!). Learn about the island’s most famous resident and his dedicated work with those who were suffering from Hansen’s Disease. Enjoy a delicious lunch at a local oceanside restaurant. Schedule: The tour is available from Monday through Saturday. No tours on Thanksgiving, Christmas and New Year’s Day. Flight departs to Molokai at 8:25am and returns flight is at 5pm. Tour includes: Round trip airfare, a guided ground tour, and lunch. Plane: Makani Kai Air uses nine-passenger turboprop Cessna Grand Caravans. Cancellation Policy: Cancellations require a 48-hour notice for full refund. Sorry, Molokai Tours from Maui do not fit the itinerary of any of the cruise ships because the flight times are too early. To really see these cliffs, and the tallest waterfall in the state of Hawaii, also consider doing a helicopter tour of Molokai which leaves from the Kahului Airport on Maui. One final thing … don’t confuse Molokai with Molokini. Molokini is a tiny crescent shaped island two miles off the south Maui coast and is a favorite destination for snorkel tours. Molokai is a large inhabited island northwest of Maui.